Why I Always Turn To eBay When I Am Trying To Save Money! Is it just me who is some what of an eBay addict? It all started a few years ago now, I discovered the magic of eBaying! When money is tight I always turn to eBay. It is a brilliant way to save a ton of money & find some great bargains. It is also so handy for selling items I don’t wear anymore & making that little extra cash. Since I am saving my money at the moment I have been browsing eBay quite a lot to try to find some bargains. It has taken me a while to find anything I REALLY want but over these past 2 days I have bought 2 items that I love – they were total bargains! The first item I bid on was this stunning Aztec Beaded Top from Next. It is brand new with tags & I paid only £9.00 for this little beauty! I love the wonderful beaded detailing & I can see me getting a lot of wear out of this! 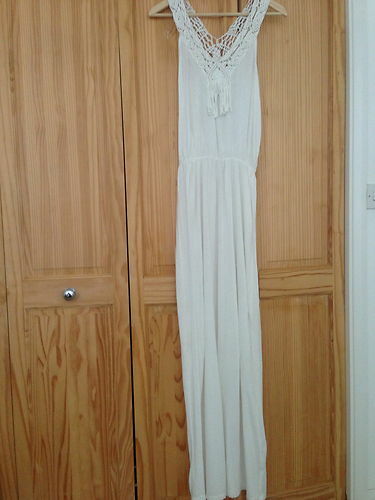 I then turned my attention to this Crochet & Tassle Detail White Maxi Dress from River Island. This was total love at first sight, something Free People would sell don’t you think? The best part about this dress is the winning bid, I paid…….wait for it……£7.00, yep only £7.00 for this glorious dress. It was on sale in River Island for £30.00 so I bagged myself a huge bargain. I am getting so good at this bargain hunting thing. Saved a lot of pennies thanks to the magic of eBay! No, you are not the only one.. I love shopping (and selling) on eBay. Great finds! That is good to know 🙂 Thank you! Definitely not the only one..I can spend hours browsing on EBay! Great finds.